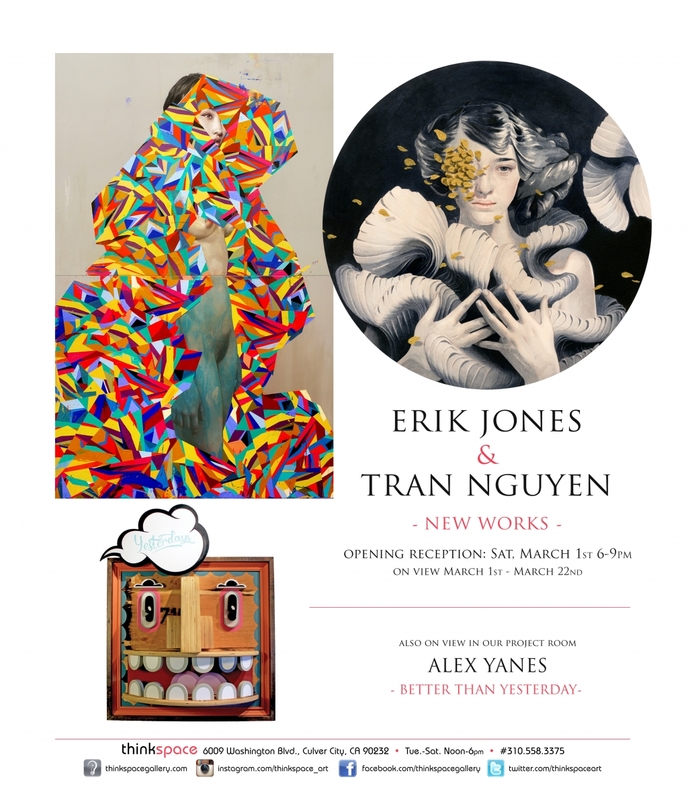 Thinkspace (Los Angeles) – is pleased to present New Works, featuring artists Tran Nguyen and Erik Jones. Both artists approach their respective imagery with a unique synthesis of elements, including figuration, pattern and an intuitive approach to stylized composition. Nguyen and Jones respectively harness a variety of illustrative influences to convey their distinct visions and aesthetic identities. Tran Nguyen is a Georgia based, Vietnamese born, artist. Working with acrylics and color pencil, her process oriented works are built through a painstaking application of acrylic glazing, and a detailed mastery of figurative illustration. Nguyen’s interest resides in the potential of associative imagery to speak to universal psychological experiences, and to the latent recesses of the subconscious. The artist’s belief in the power of the image to fulfill a therapeutic role is at the heart of her practice. Nguyen creates narrative works that are intended to appeal to a shared consciousness, and to the anxieties and challenges faced by the human psyche. She invokes the affective valence of these shared hardships in her work, and draws from them with a deeply empathetic and symbolic approach to representation. With an emotional generosity, her work strives to speak to the viewer on a personal level, and this engagement dominates her choice of psychological themes. Nguyen’s interest in the psycho-therapeutic potential of art results in deeply moving, and at times unsettling, surreal vignettes that extend beyond the self into a shared realm of experience. Erik Jones is a New York based artist who deftly combines a hyperrealistic approach to figuration with an expressionistic, and idiosyncratic, incorporation of color and pattern. Jones clothes his figurative subjects in brilliantly patterned areas of color and geometry. Superimposing the graphic precision of these expanses against beautifully rendered portraits, the artist offers surrealistic images through the collusion of unexpected relationships. Jones achieves these phenomenal combinations of abstraction and representation with a mixed approach to media: incorporating watercolor, colored pencil, acrylic, water-soluble wax pastel and water-soluble oil on paper. The resulting imagery is luminous – the abstract elements are incorporated seamlessly to suggest geometric non-representational “fashions”, effectively “worn” by his encompassed subjects. The intuitive spontaneity of his mark-making dynamically activates the realistic rendition of his human portraits, positing an aesthetic tension between the hyperreal and the surreal through the exciting amalgam of graphic contexts. The works are beautifully executed, and reverberate undeniably with excessive life.